Ink sac sprung a leak? Vacumatic won’t fill? Got an old fountain pen that needs an overhaul? Well, you’ve come to the right people. 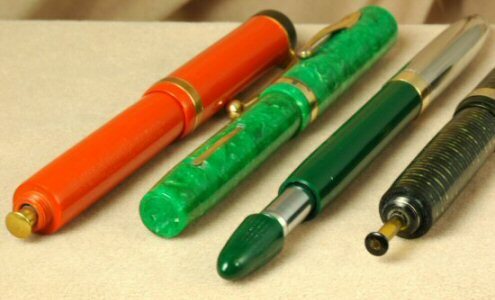 At ThePenMarket.com we can restore most vintage fountain pens-button fillers, lever fillers, plunger fillers, Sheaffer piston fillers, Sheaffer Touchdowns and Parker Vacumatics. Not sure what type you have? Check out the six fountain pens below in the pictures. Does one resemble your pen? If it isn't one of these styles, we are sorry to say that we are not yet able to restore European-style/Nozac piston fillers or Snorkel fountain pens. If you are still not sure what type of pen you have, send us an e-mail at repairs@ThePenMarket.com or call us at (847) 708-5062. If you are not satisfied with the estimate, your pen will be shipped back to you free of charge. Discounts will be given for shipments of 5 or more pens for repair. Generally, restoring a pen is a very safe process for the pen. However, given the age of the pen and materials used in past repairs, there is a risk that the pen, through no fault of the restorer, could break. Unfortunately, on rare occasion, these things happen. We promise to take the utmost care in restoring your pen, but by agreeing to allow us to restore your pen, you acknowledge these risks, and waive all blame and rights to any compensation in the event the pen is damaged. If you do not agree to these conditions, your pen will be returned to you in the condition in which it was received. Furthermore, it should also be noted that Sheaffer never really intended for its piston-filler pens to be restored. Although they can be fixed, these pens face the greatest degree of risk during restoration. Please be sure the pen is empty. Wrap it several times in bubble wrap. Insert the wrapped fountain pen in a piece of PVC tubing. Ship the pen in a padded, hard cardboard box. If you have any other questions about repairs, please don’t hesitate to ask at either repairs@ThePenMarket.com or (847) 708-5062. We look forward to hearing from you and earning your business!